Attorneys should be on the lookout for a slew of new bovine clients. Police Officers in Pocatello, Idaho shot and killed a 1,000 pound escaped cow last week. Allegedly, the cow had liberated herself from Anderson Custom Pack, a meat processing business at 3080 North Main Street in Pocatello. An employee stated that he was preparing to slaughter the animal when it bounded over a six foot tall fence, seeming with a desire to again taste freedom. 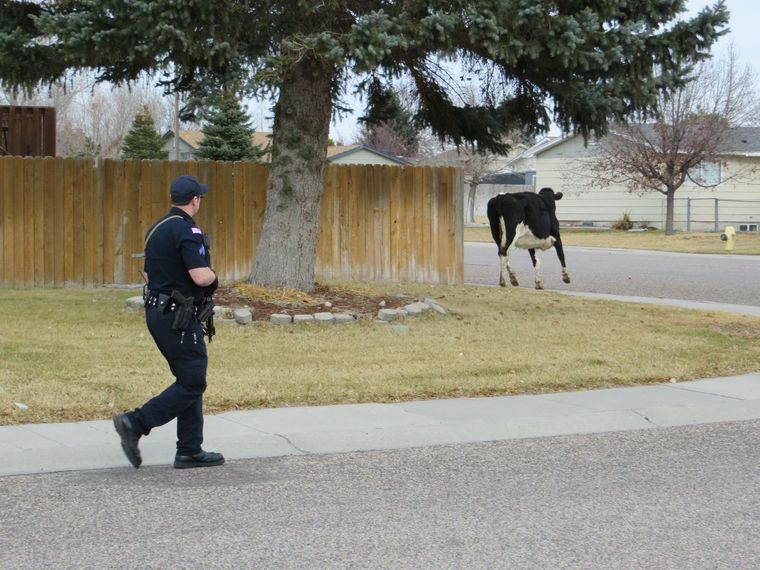 Eye witnesses called 911 as the at-large cow made its way through several neighborhoods while leading officers on a prolonged slow-speed police chase throughout the city. Some of the chase was even caught on amateur video. At this time NCAVF has not yet been contacted to evaluate or enhance the video footage. It was shortly after her escape, that the cow began her rampage. In a desire to milk her new found freedom, the cow rammed two Pocatello Police vehicles, an animal control truck, and caused several traffic collisions. It then charged through a playground on Hawthorne Road as well as through residential neighborhoods adjacent to Hawthorne. It was at this point, fearing for the public’s safety, that police decided that lethal force was indeed warranted. The order to fire was given. Having cornered the cow in the backyard of a residential home off of Quinn Road, one officer did manage to shoot the cow in the head. This, however, only seemed to solidify the resolve of the cow as she bolted past officers and continued to give chase. The pursuit continued to weave around the residential streets with both police and animal control units hot on her tail. Having decided that she was not going to be taken alive, the cow again allowed herself to be corned in a backyard off of Henderson and Jesse Clark Lanes. After a brief, but albeit intense standoff, an officer fired once, again striking the cow in the head. This time, she died instantly. Police and animal control units loaded the cow’s body onto a truck where it was brought back to Anderson Custom Pack. Currently, it is unclear if efforts to reach the cow’s family have been successful and so far, there is no word as to whether or not her family will be seeking restitution through the courts. In lieu of flowers, residents of Pocatello are encouraging folks to eat more beef.